Andrew Moyes (above), Managing Director of Nicholson & Co., UK, gave a fascinating presentation on Holy Trinity’s new organ at our recent AGM. Nicholson & Co. was founded in 1841 (same as Parnell!!). The founder, John Nicholson, died in 1895 and Andrew is the seventh Managing Director in 175 years. Nicholson & Co. is one of three firms in the UK capable of building large organs of the scale of Holy Trinity’s. How do they design and build such a large organ? It is rare to have the opportunity to design a brand-new cathedral organ. On the strength of their organ design for the Llandaff Cathedral in Wales, they were invited to Auckland in 2012 to give a proposal for the new organ. Andrew accompanied by their Tonal Director, who designs specifically for the acoustics, came out. Originally there was a bridge in the cathedral which broke the building into two parts. So, Andrew saw a great opportunity for the organ to be built in the space where the bridge was, a perfect space in the middle of the building. it is a huge piece of furniture so how it looks is very important. If the organ is put in a chamber, it cannot be heard properly. So, the pipes need to be in a position where the congregation can see them and receive the high frequencies of sound, from the smaller pipes, clearly. The big pipes (32’ long) give low frequency sound which will spread well everywhere and thus may be hidden. In the Holy Trinity these two aspects came together very well with excellent acoustics and visuals. 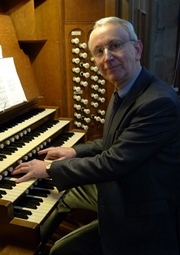 The original organ in the cathedral was placed where it was difficult to be heard and hence needed to ‘shout’ which was not good, ie it had to be played with more force and would lose the finer nuances. They employed a Frenchman, Didier Grassin, who worked for an American organ building company, and he came up with a very ingenious design without visiting the building placing the organ where the two parts of the building collide: the more austere 1930’s design and the Maori-inspired nave. This has changed completely the cathedral’s interior. How is the organ built? It took 20 months to build. It was so large it would not fit into the factory so was built in three sections and only came together in Auckland. It took 6 months to install, two teams of four men in 6 week relays. The final installation took place at the beginning of 2017 and it was finished at Easter. What are the components of the organ? There are 5,432 pipes ranging from the biggest at 32’ long to the smallest that is the size of one’s little finger. The biggest pipe is made of wood and weighs two-thirds of a tonne and is built in three sections. This organ is the biggest to have been built in the UK for 63 years. The organ weighs 40 tonnes. It was packed into seven 40’ containers which were loaded into the ex-refrigerator holds of the ships to give extra protection. There are two consoles, where the organist sits, one on top of the transept and the other is a mobile console that can be wheeled around. The connection from the consoles to the pipes is digital. The sound itself is air blown through the pipes. The air is generated by six electric blowers. The Holy Trinity organ is the largest musical instrument in New Zealand and the largest organ in Australasia. Why is it so big? This is due to the acoustic space and to give a large tonal palette. The bigger the organ the greater the variety of tonality. The Auckland organ is very versatile and has an enormous repertoire of performance potential.